For the following census, shipping and petition information I am most grateful to Shelly Farr. John HITCHINGS, wife and 4 children sailed on the Aboukir, a new three masted barque of 816 tons which was chartered to return to Britain with copper ore from the Burra mines. The ship departed London on 20 May 1847, and Plymouth on 1 Jun 1847 with 302 immigrants. John HITCHINGS (HUTCHINS) was one of the 30 Cornish miners aboard who had come to work in the copper mines. Friends and relatives from the western coast of Cornwall were among the fellow passengers. After a passage of 95 days the Aboukir arrived at Port Adelaide, South Australia on Saturday 4 Sep 1847. 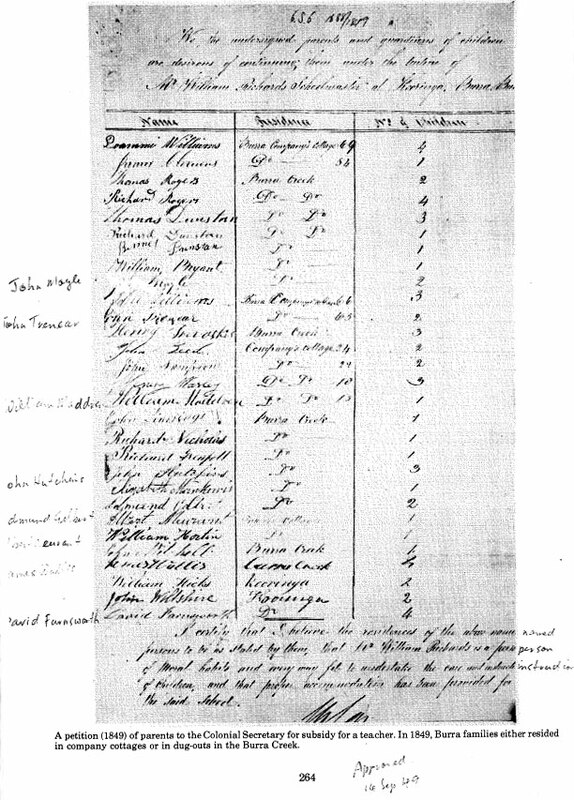 The shipping list for the Aboukir from the South Australian Register, 8 Sep 1847 is transcribed on this website. In 1851 almost half of the population of over 4000 lived in 600 dugouts which had been excavated by the miners in the banks of the Burra Creek. These caverns extended for 3 miles but floods in 1851 inundated 'Creek Street'. By mid 1851 the copper mining settlements north of Adelaide at Burra Burra and Kapunda formed the largest inland settlement on the Australian continent but after gold was discovered in August 1851 there was an exodus to the goldfields of central Victoria. Catherine's death certificate confirms that the the family spent about 7 years in South Australia before moving to the Creswick area of Victoria, most likely, early in 1854. Two of their daughters, Mary and Rosetta HUTCHENS were married at the Kooringa Church on 29 Mar 1852 and 27 Dec 1853 respectively.